We have found our new favorite book! 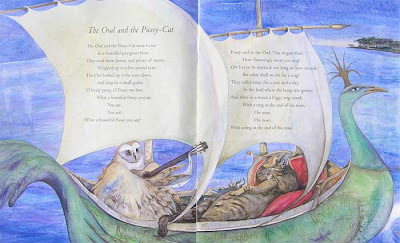 This one--The Barefoot Book of Classic Poems--is a keepsake for the ages. 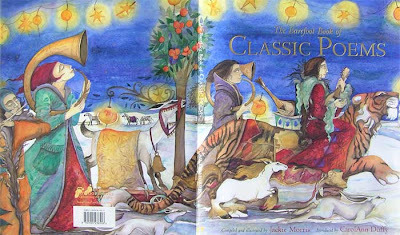 Compiled and illustrated by the magical Jackie Morris, this book includes poetry by the likes of e.e. cummings, Edgar Allen Poe, Lewis Carroll, Lord Byron, Dylan Thomas, W.H. 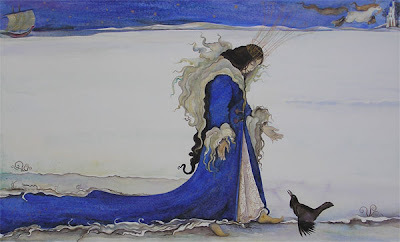 Auden, Yeats, Tolkien and Shakespeare. And these are only the highlights! It is, quite simply, the most divine children's book I have ever seen. If we could only keep one book for our little one, this would be it. Many thanks for this lovely review. We know that She will be pleased, and so will Max, our tabby, who posed for the Owl and the Pussycat painting. She says have a look at Can You See a Little Bear by James Mayhew, illustrated by Her too. Little ones like the detail and lurking in the pagges you will find Max again. He is a very busy cat.